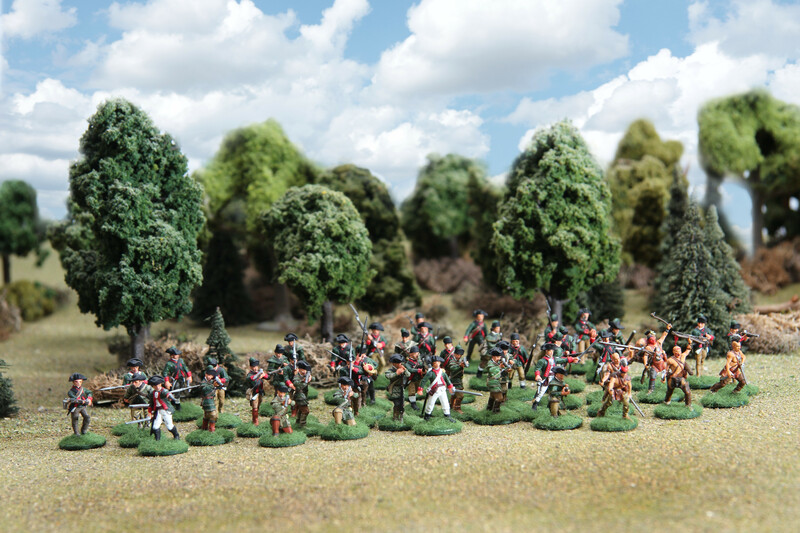 Now that I have completed my Butler’s Rangers Company I have set up a small AWI skirmish size battle. 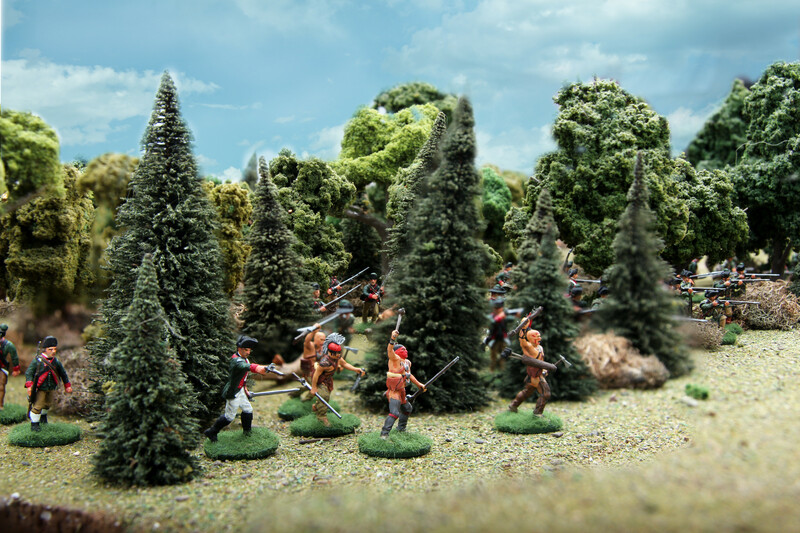 On the British right hand flank the Butler’s Rangers have taken up positions in the woods with the guidance of a few native scouts. 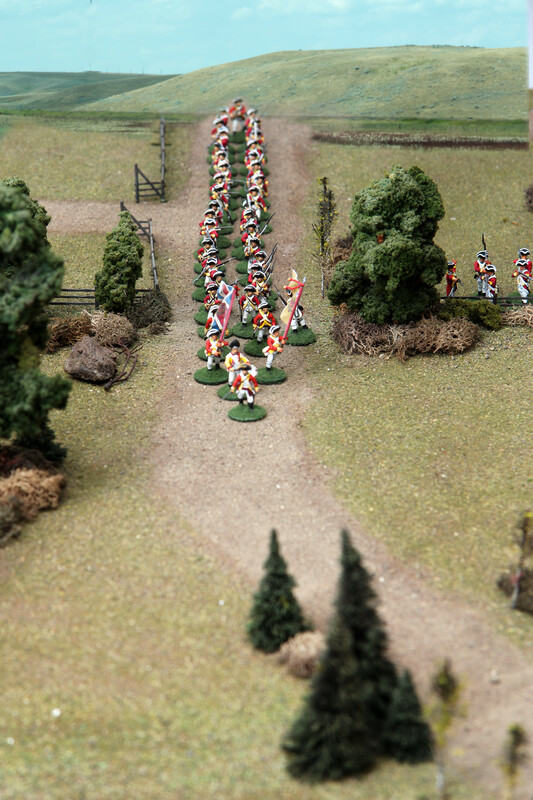 On the British Left we have the 10th Regiment of foot drawn up in line with support of a 6 lb. artillery piece. 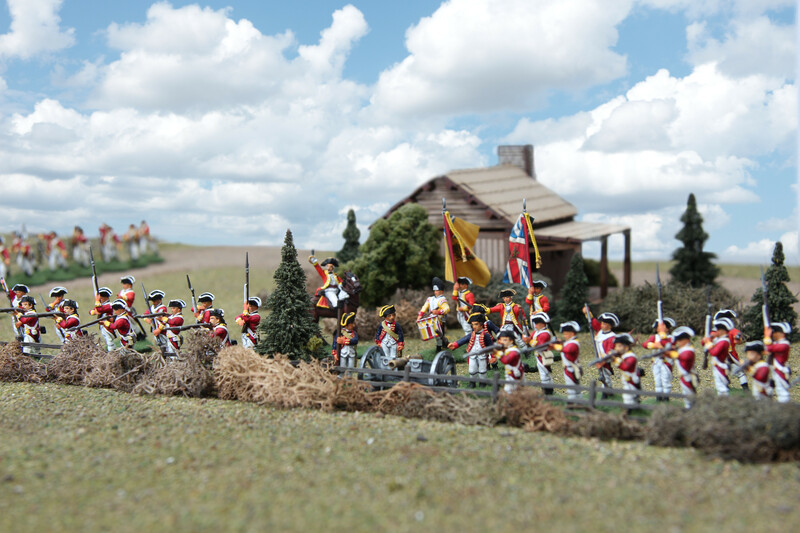 In the center, the British 15th Regt. is moving forward to take up position. 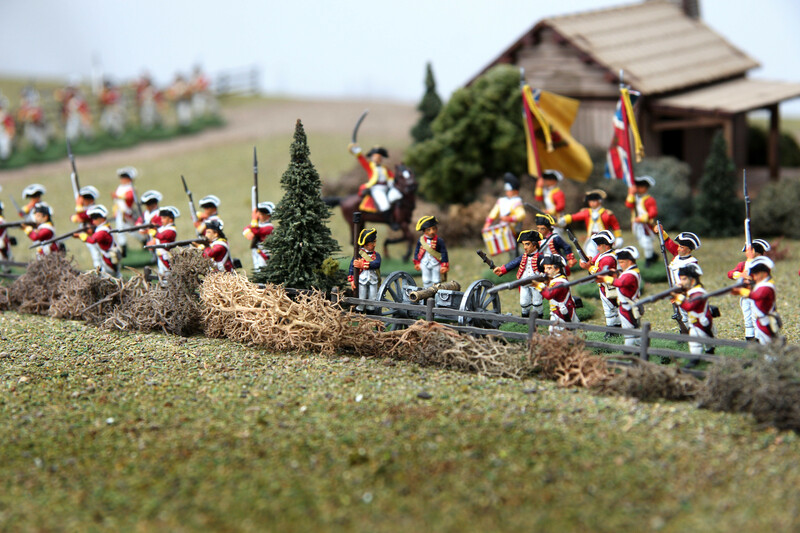 Opposite the Crown’s forces, the Continental 1st and 2nd Pennsylvania Regiments are holding the block house and some fortifications. Although outnumbered, they have the advantage of being behind cover. 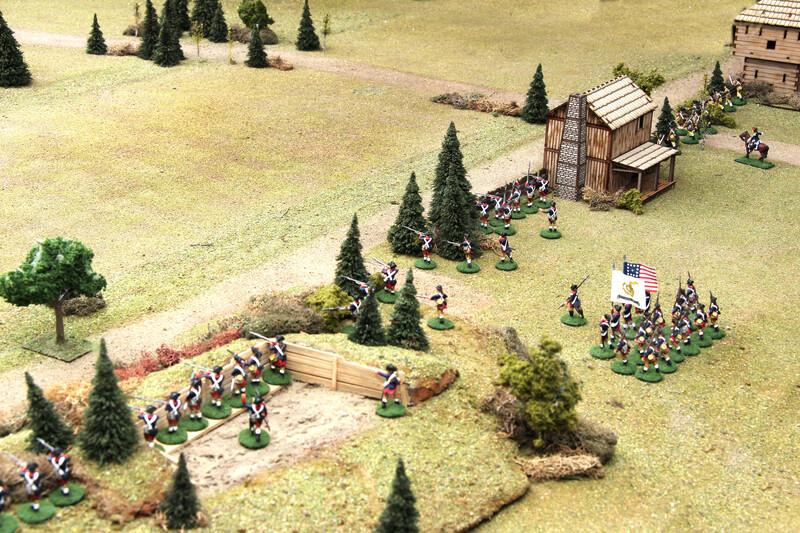 The 1st Penn are holding the blockhouse on the right side of the American line while the 2nd Penn is holding the house fenced yard and redoubt on the left. So the battle is set. For the Crown, Glory or for freedom from tyranny! 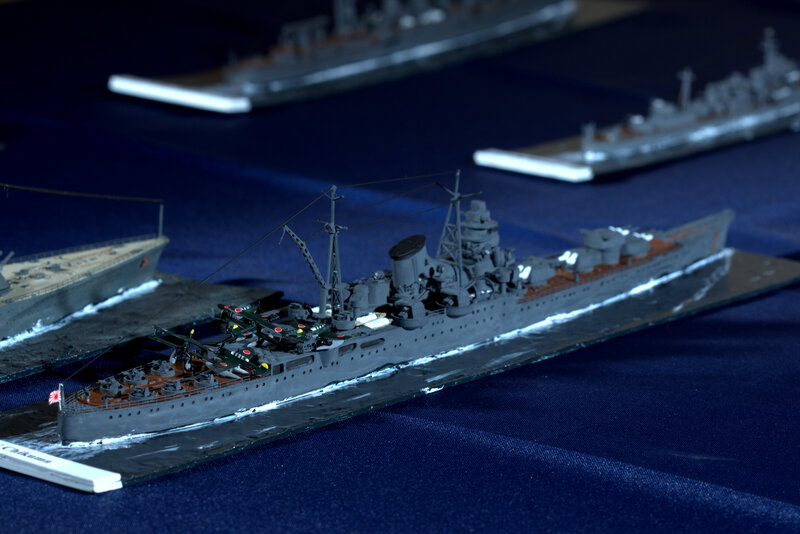 I will add more battle shots as the battle progresses. 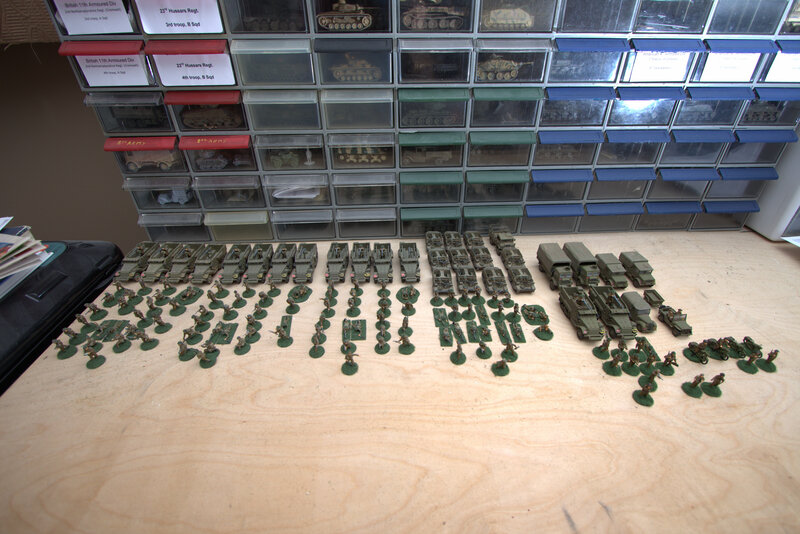 Well it took a little bit longer to finish the remaining troops and vehicles of the WW2 US 4th Arm. Div. than I anticipated. 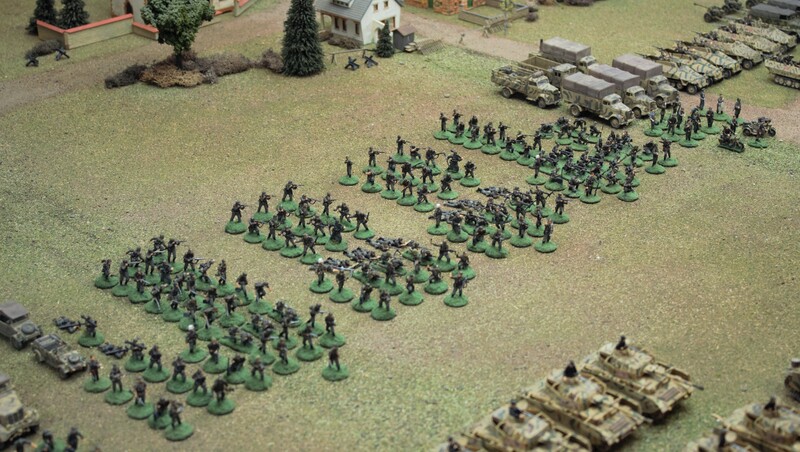 Now that they are done, I can finally start the offensive against the German SS holding the town. 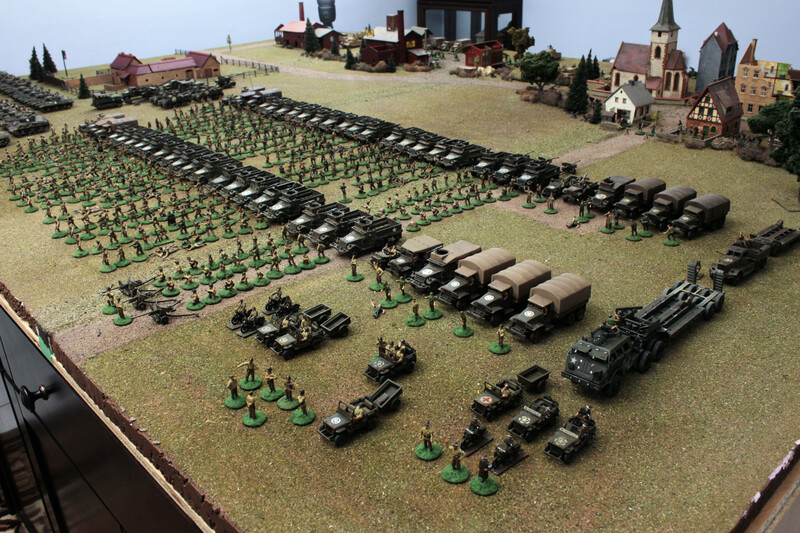 My American Army consists of 2 company size combat commands with support elements. 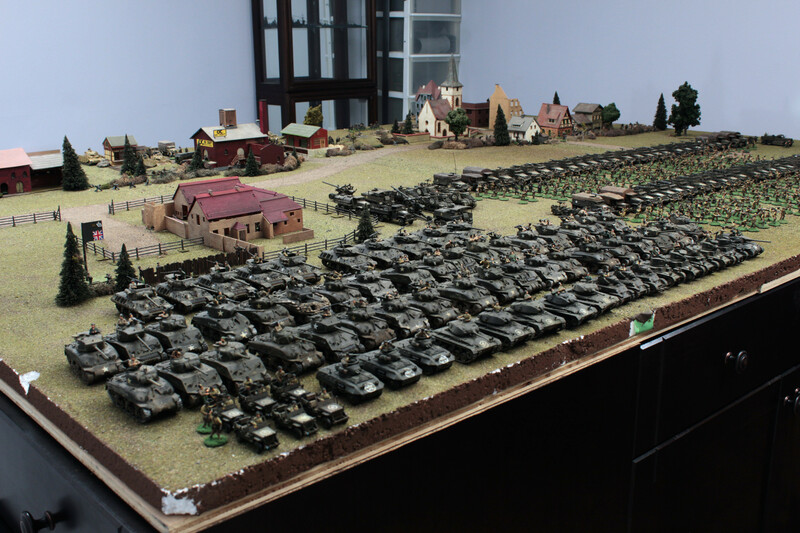 The Tank strength of the division is 37 medium tanks (Sherman), 13 light and 11 Tank Destroyers for a total of 61. 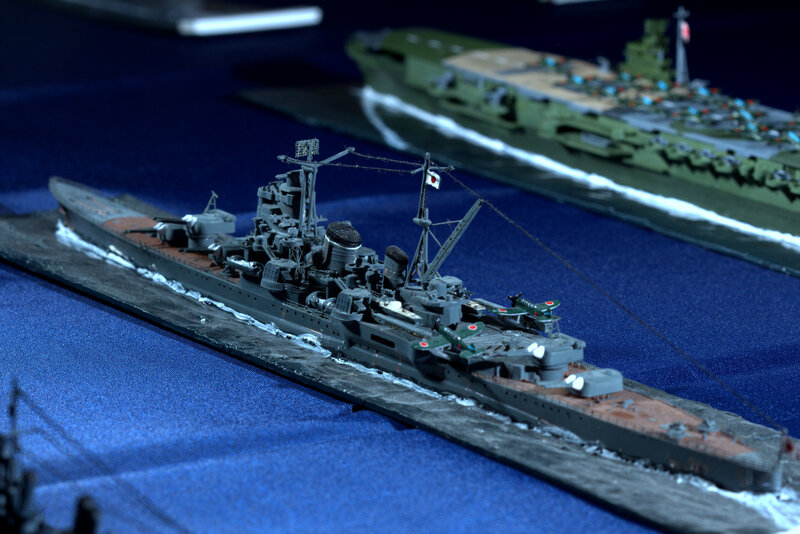 Like the German army, there is a mix of tanks and weapons that span over a couple of years to be able to play different battles and to reflect a realistic attrition. 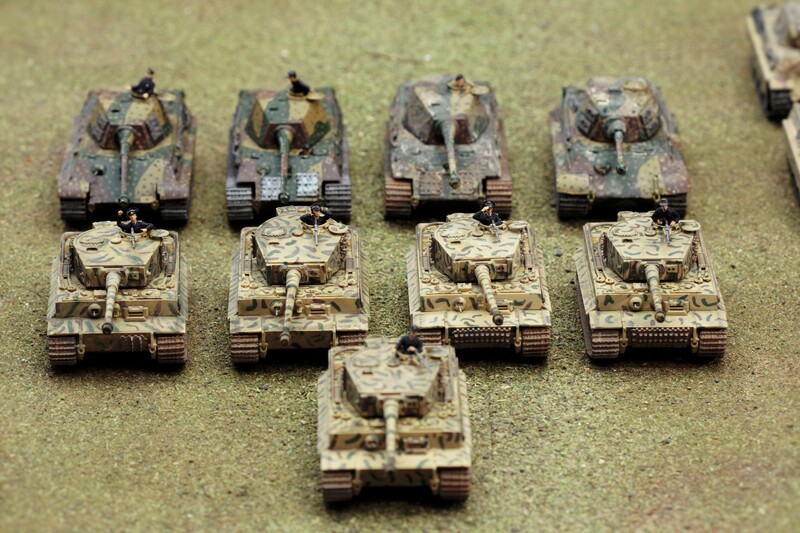 Out of all the tanks and vehicles in this army my favourite are the M36 and M10 tank destroyers from Eduard despite some historical inaccuracies. When this army was started several years ago, there wasn’t the selection available today. 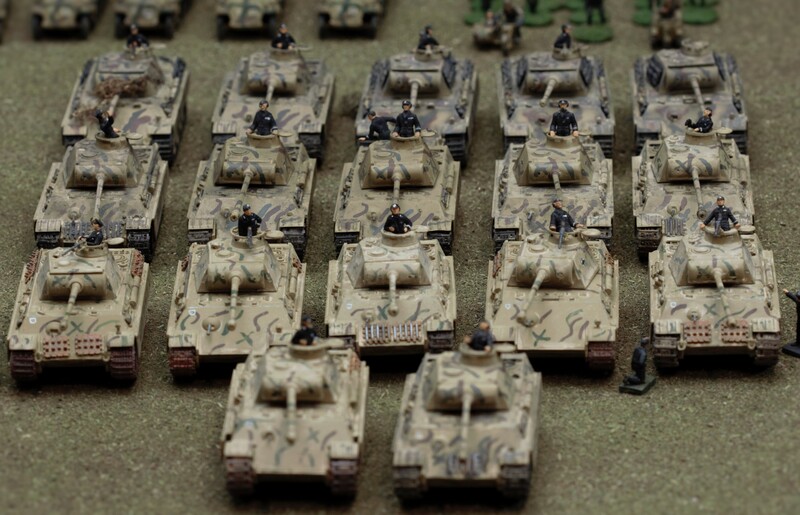 The two armored Infantry Companies have 254 men each in their ranks. 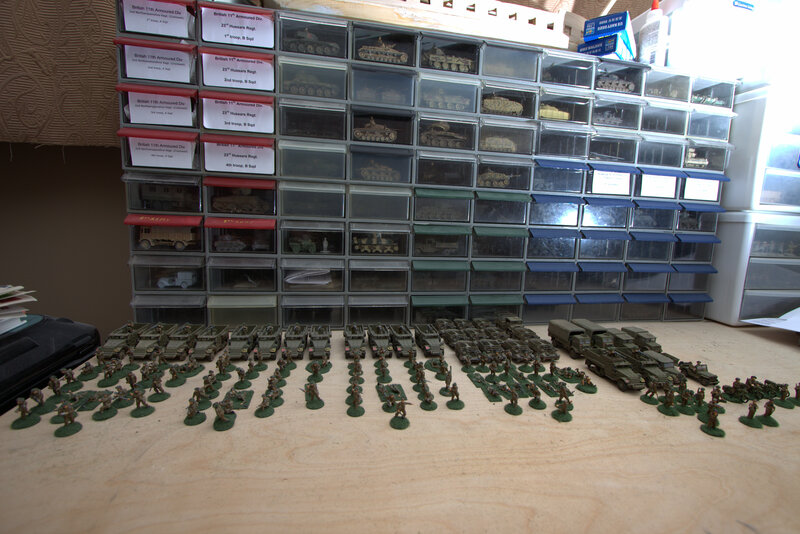 Even though the organization is complete most of the soldiers are plastic from multiple manufacturers. 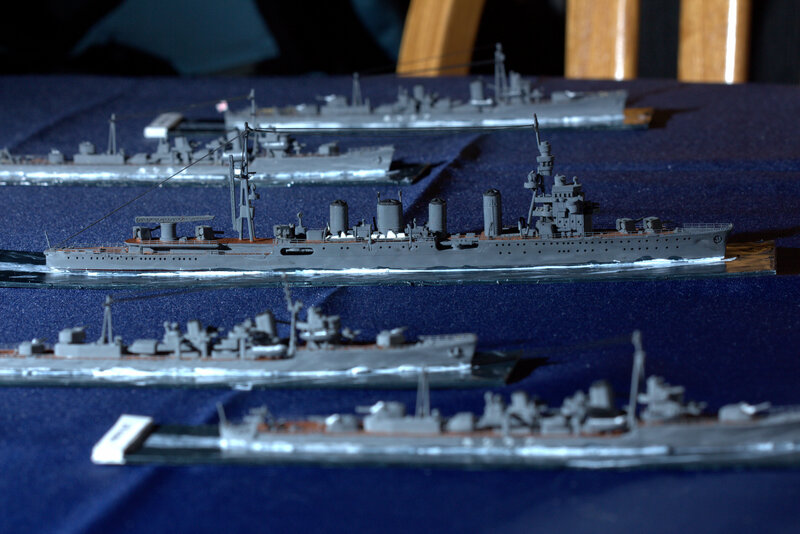 As time and new products become available I am slowly starting to replace those with metal figures such as AB miniatures. 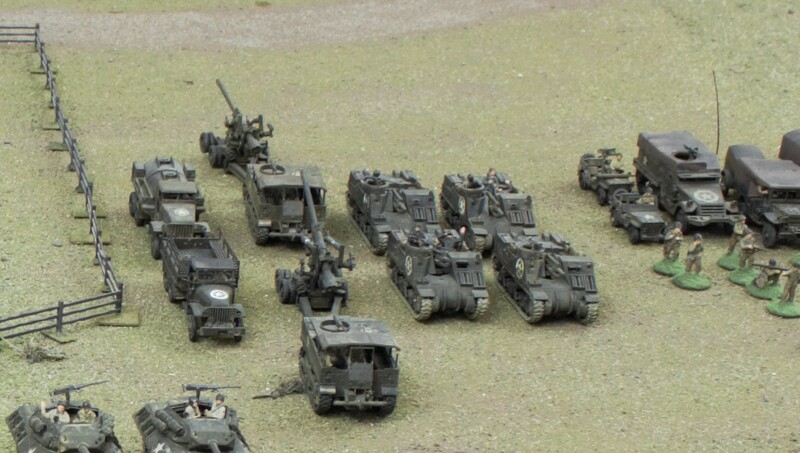 For example, my next project with these companies is to replace the current platoon mortar squad with the correct 60mm mortars and move the 81mm mortars to HQ. 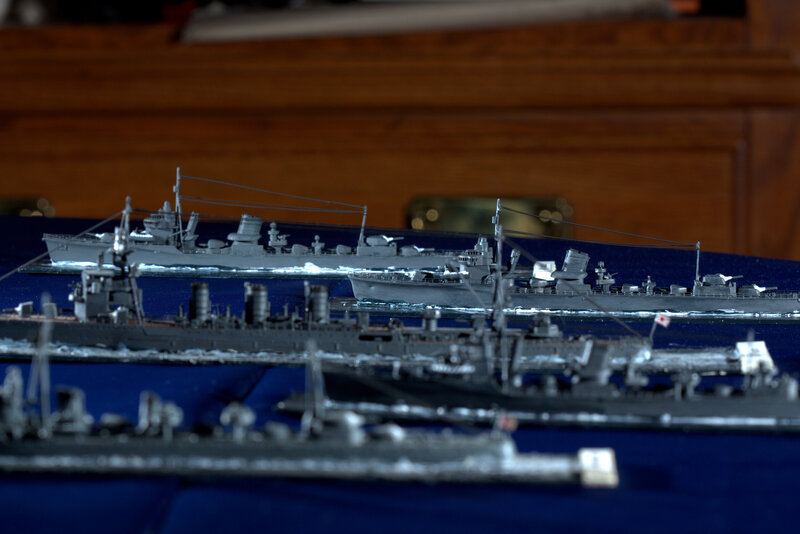 As you can see from the pictures below, I do have a small sampling of 105mm M7 Priests and 155mm Long Tom artillery pieces. 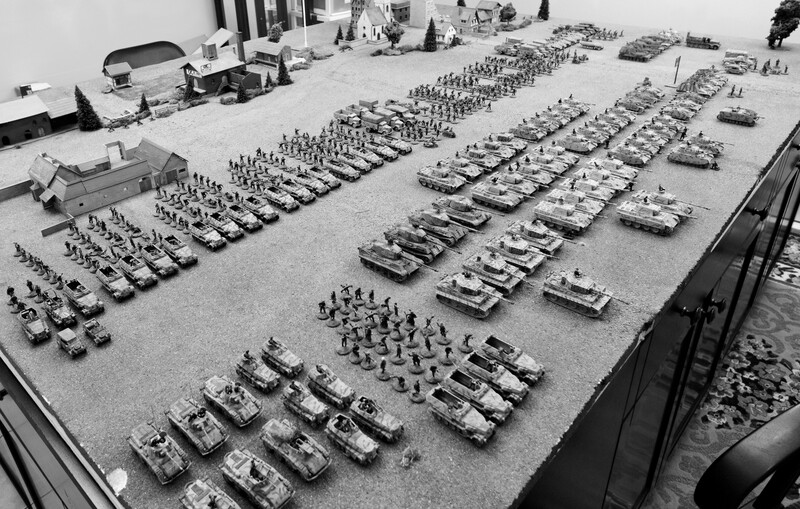 Even though I enjoy building the artillery I usually do not collect full units because of the pieces being off table during a battle. The next picture shows an orders group with the commanding officers of Combat Command A and B with the General and some staff. 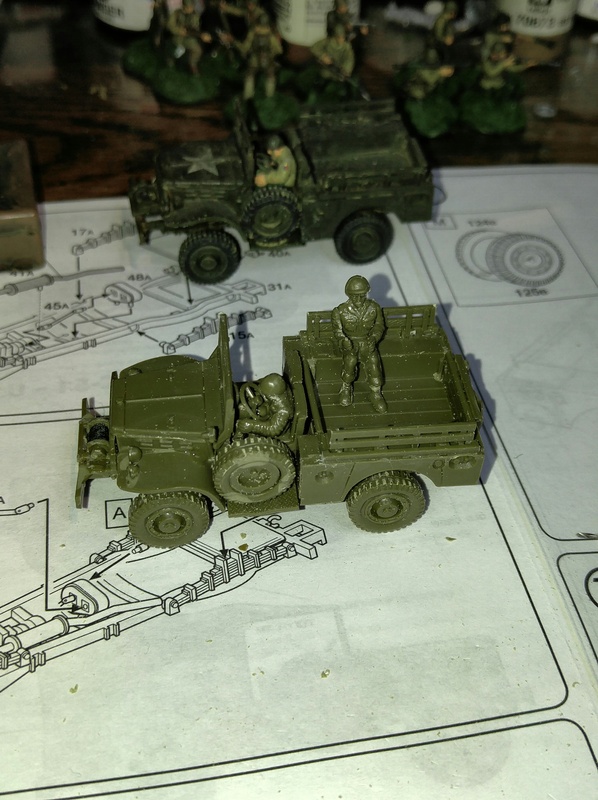 Finally the angle of the picture below shows a Medics jeep, Military Police and recovery vehicles. Now that the pictures have been taken it is time to start using the troops. 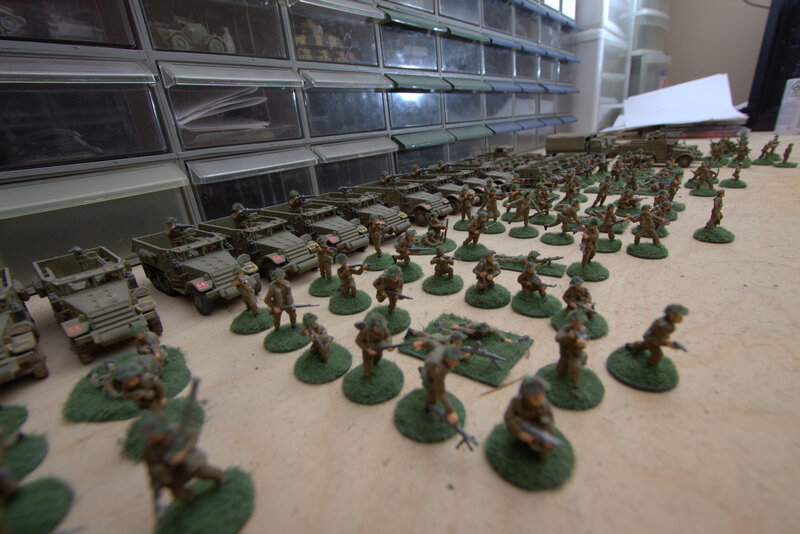 The units will be shelved until they are called upon in the battle. 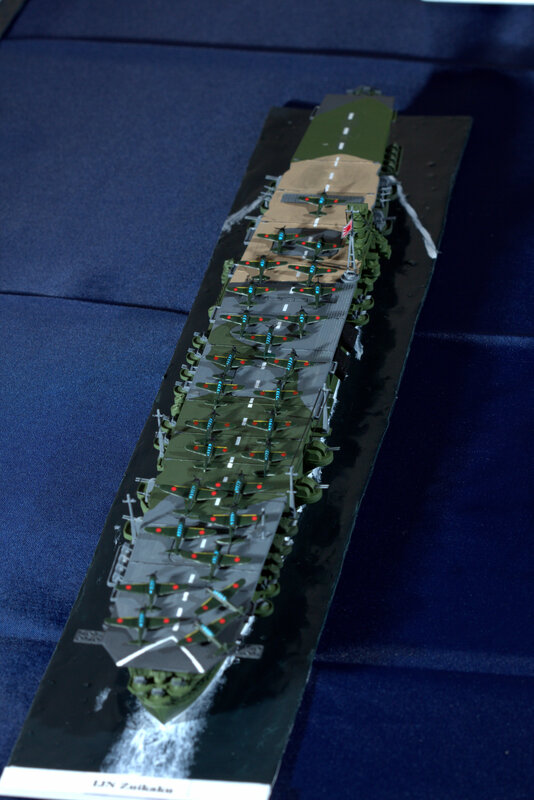 Most of the area where the Armored infantry are displayed above will be replaced with trees with a gap going down the main road. 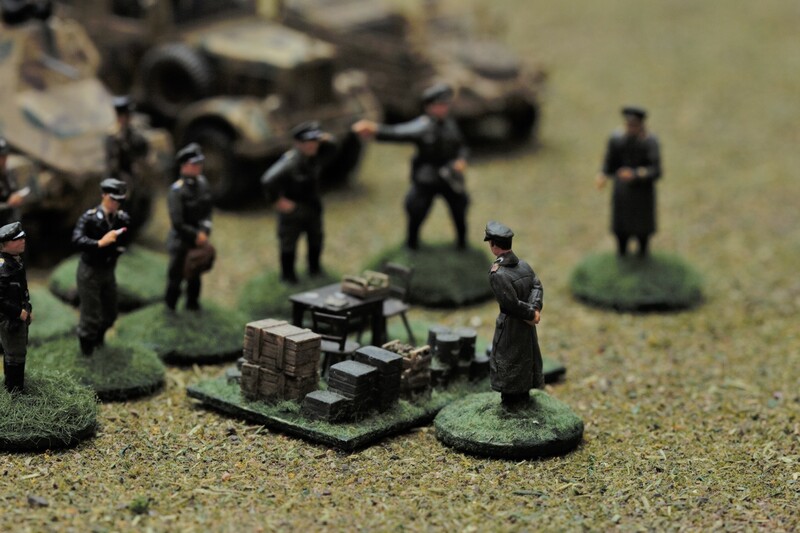 These 2 scaled down Combat Commands will be tasked with pushing the Germans out of the town. 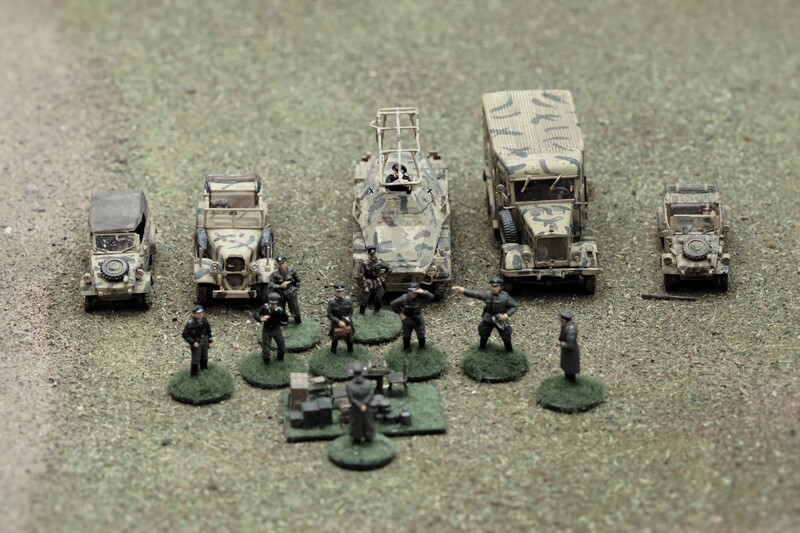 The Germans have a motorized Panzer Grenadier company in the town with the support of armor and artillery. Even though the US Army has a 3 to 1 advantage in men and armor it is going to be a tough fight. I will be taken some pictures as the battle progresses so stay tuned. 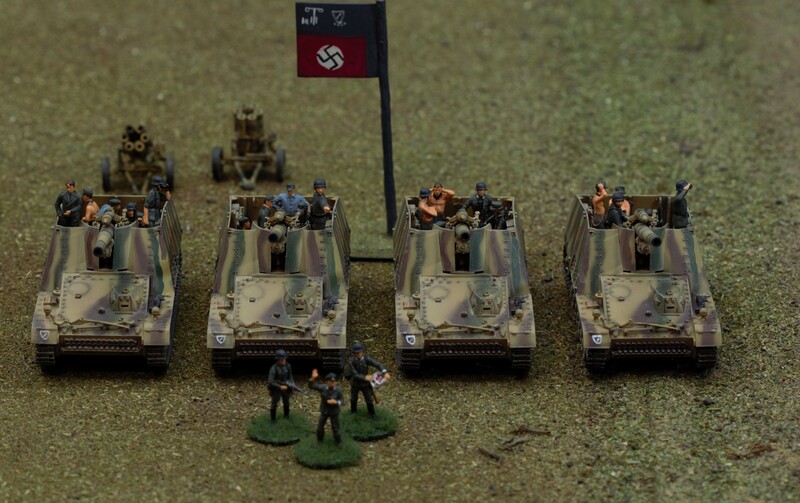 After all the building, painting and pictures of my German Army I thought I had better finish off my American 4th Armored division before I start the next battle. 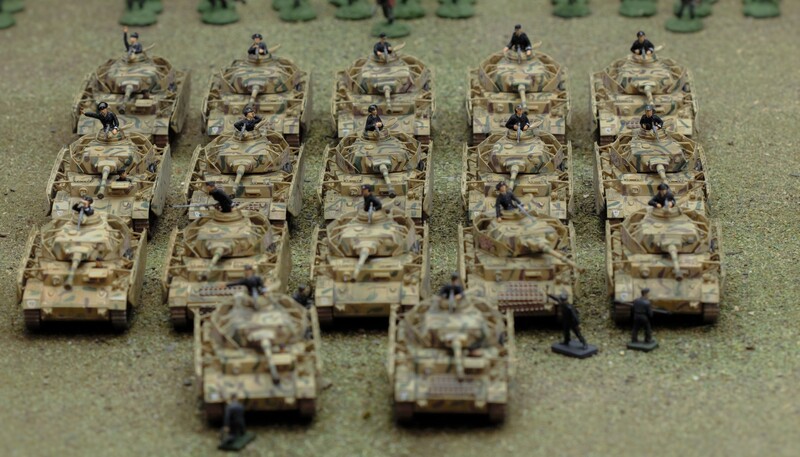 Most of Combat Command A and B are complete except for the second Armored infantry company (pictures coming soon). 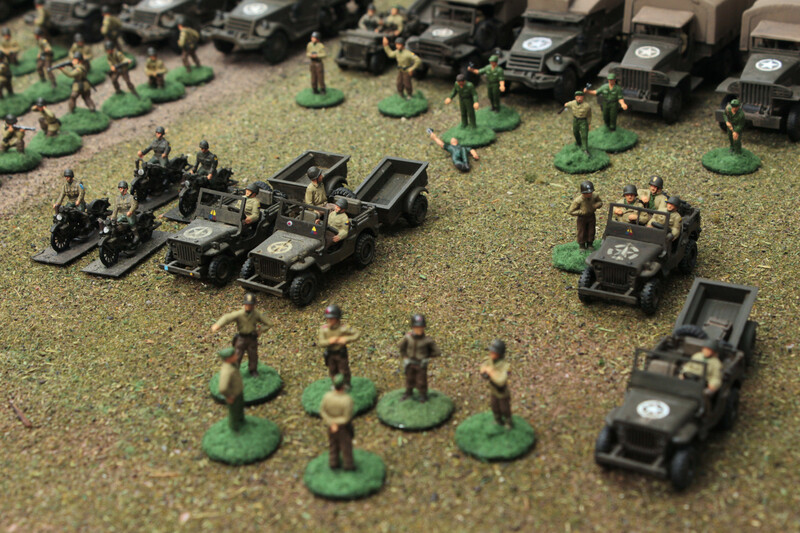 The 3 infantry platoons were built and painted but the A/T platoon and headquarters were still on the shelves. 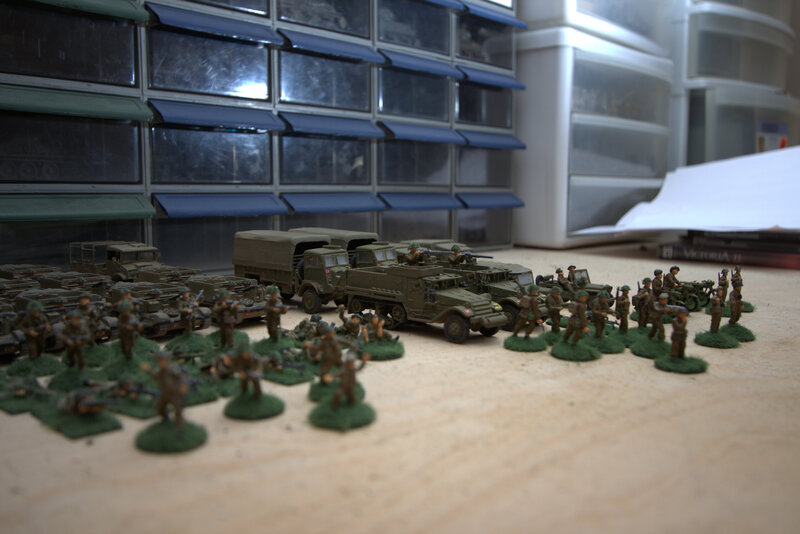 Unfortunately, when I was moving a couple of years ago the 3 infantry platoons were also roughly handled and those that were complete were damaged. 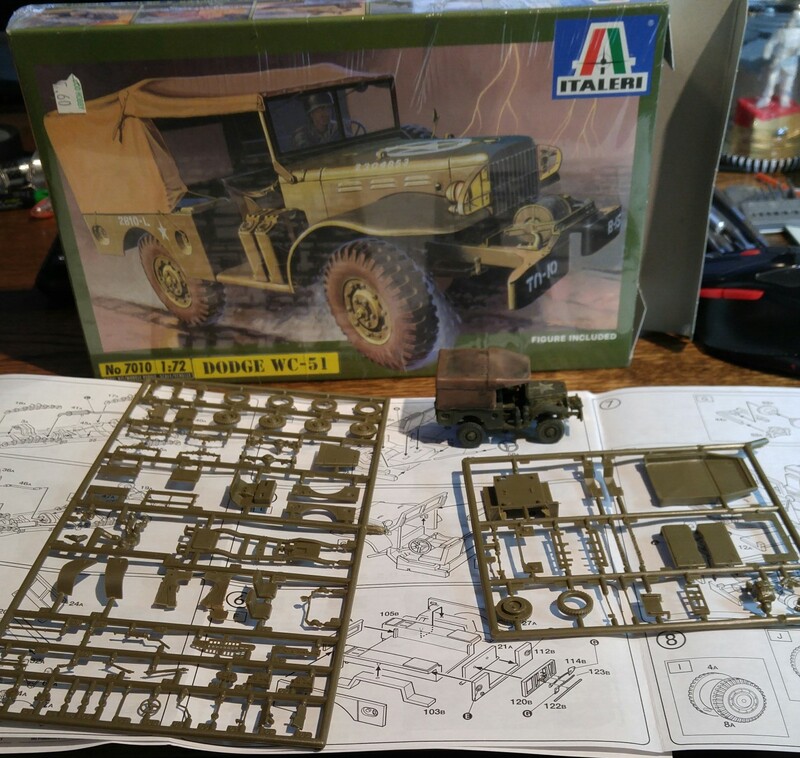 After building and priming the halftracks and 2 1/2 ton trucks I started building two Italeri Dodge WC 51s to add to the headquarters. 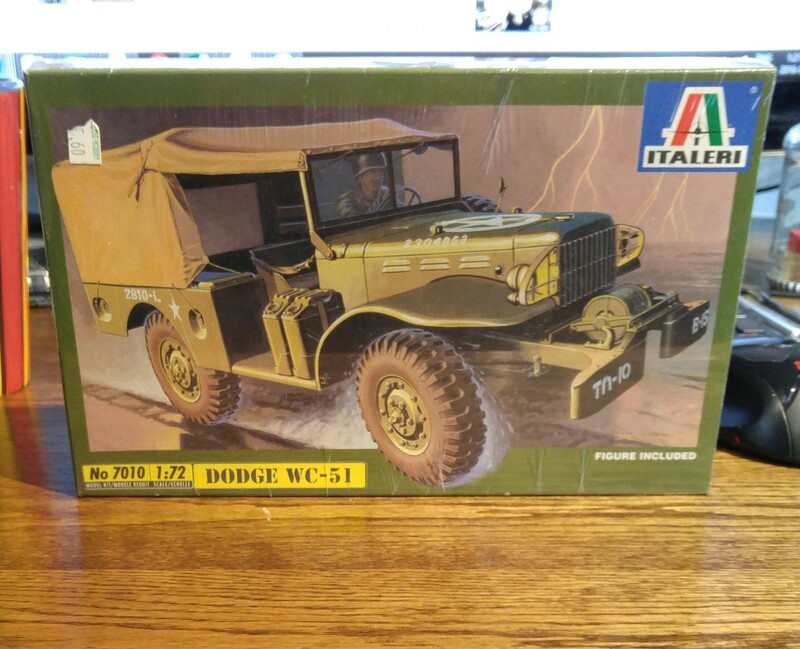 The first thing that strikes you when you look at the box is the size of the box and the great picture of the vehicle rushing through a storm. On the back of the box is several nice colored pictures with markings. The box is a little deceiving and way oversized for the contents inside. I remember the smaller Esci box was not even filled when I built my first 2 Dodges 15 years ago. 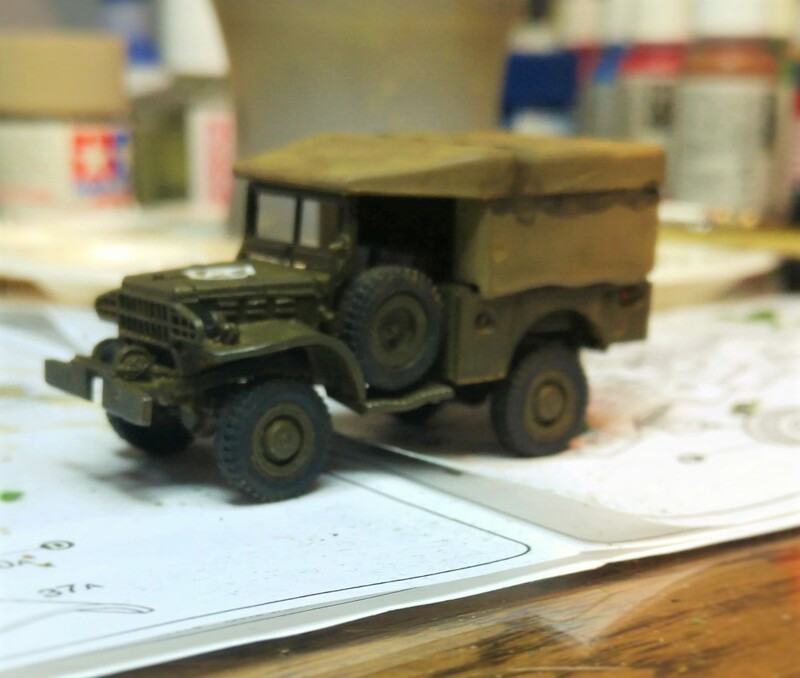 The original Esci # was 8039 U.S. Light Truck WC 51 3/4 ton. Actually the only thing that fits the box is the instructions. 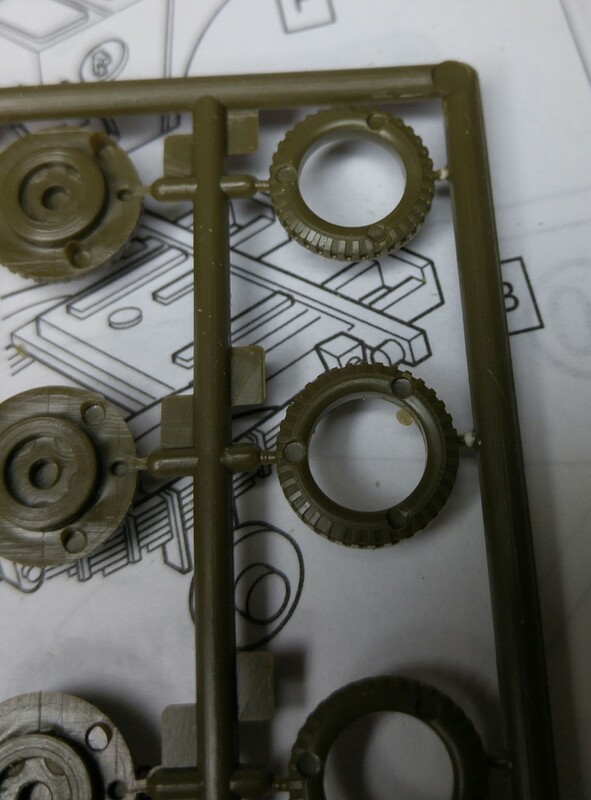 As with all old Ecsi kits from the early to mid 70s there is a lot of detail on the finished kit. This one is no exception. 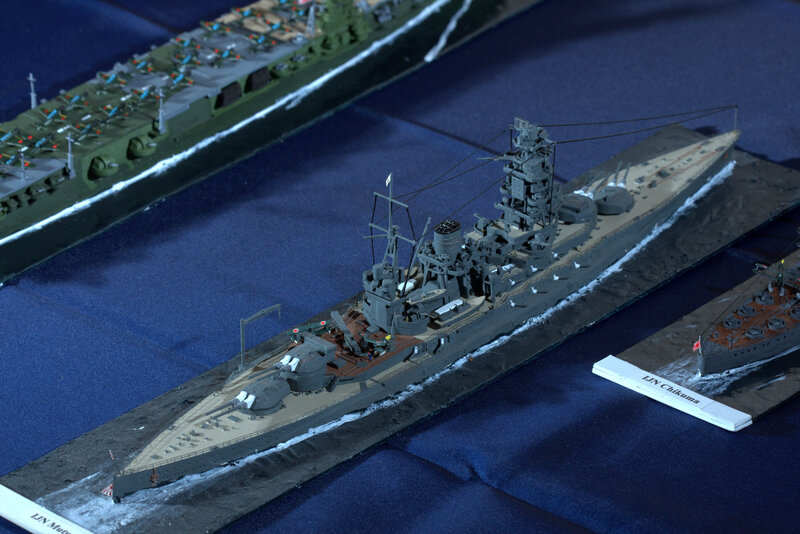 In fact for the size of the model it is probably a little overkill but overall it looks really nice when complete. The detail may be nice but the mold is showing its age. The amount of flash and the number of sink holes on this particular example took a lot of work and extra time to fix. 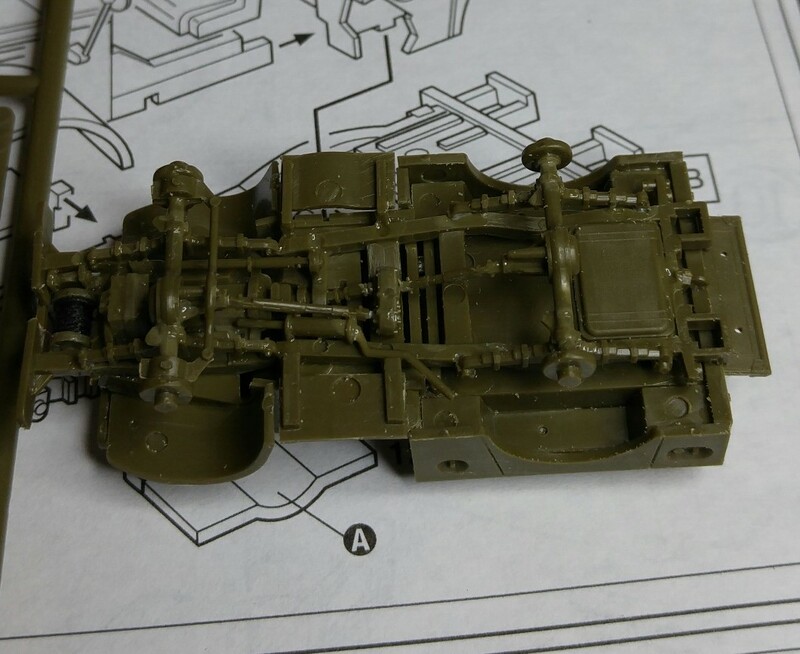 The instructions are fairly straight forward and clear except on some of the steering components. 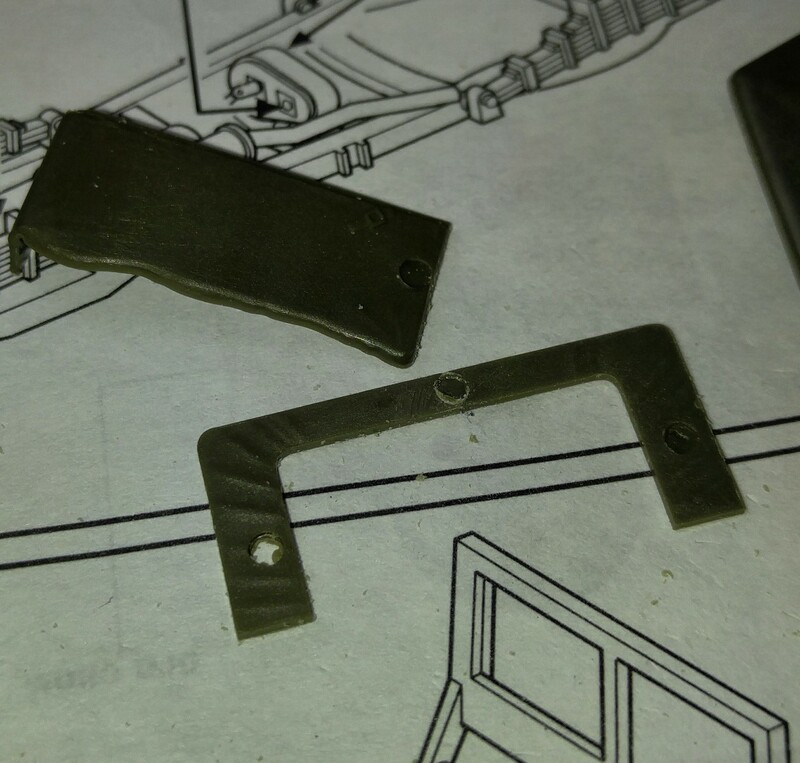 Also there are errors that I found on the springs and the front pulley mounting which is not clear. 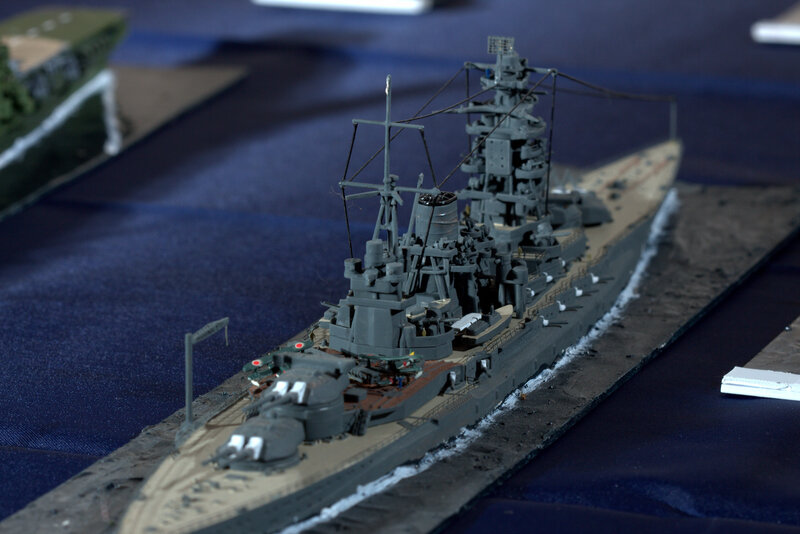 The picture below shows just how detailed this kit is. More sink holes even on A surface parts like the tarp. Some penetrating all the way through. More putty and sanding. 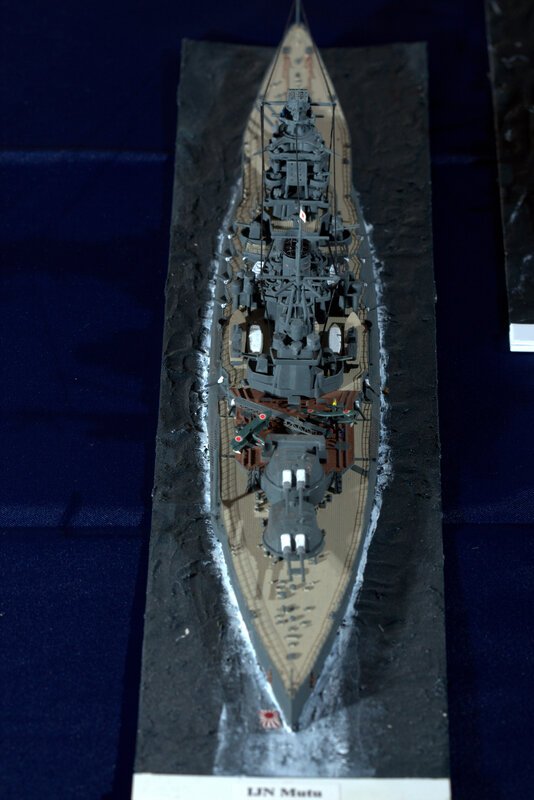 Finished model. Now for the painting. 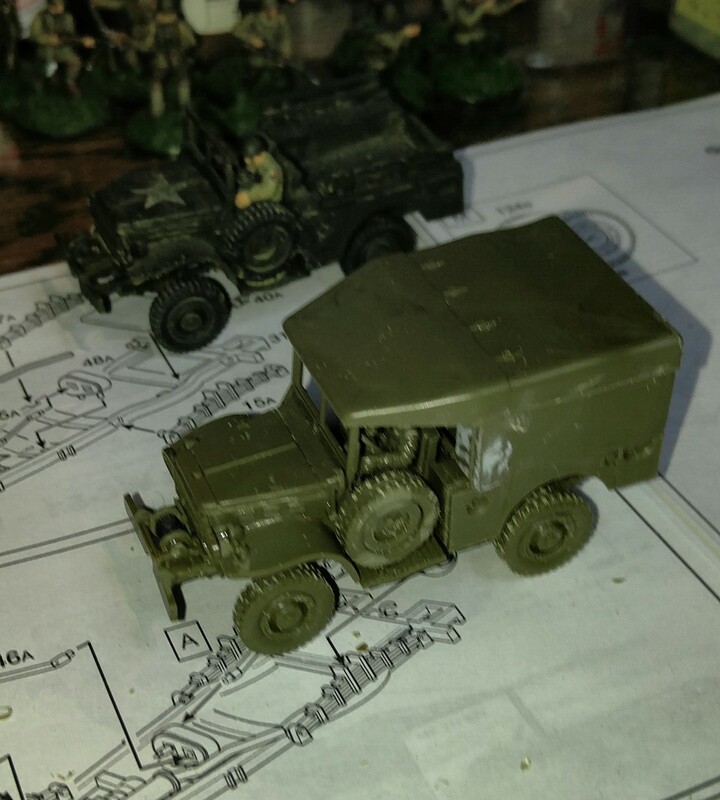 The base coat I use for the American Army is a mix of about 90% Tamiya’s XF62 and about 10% Vallejo 915 Deep yellow. 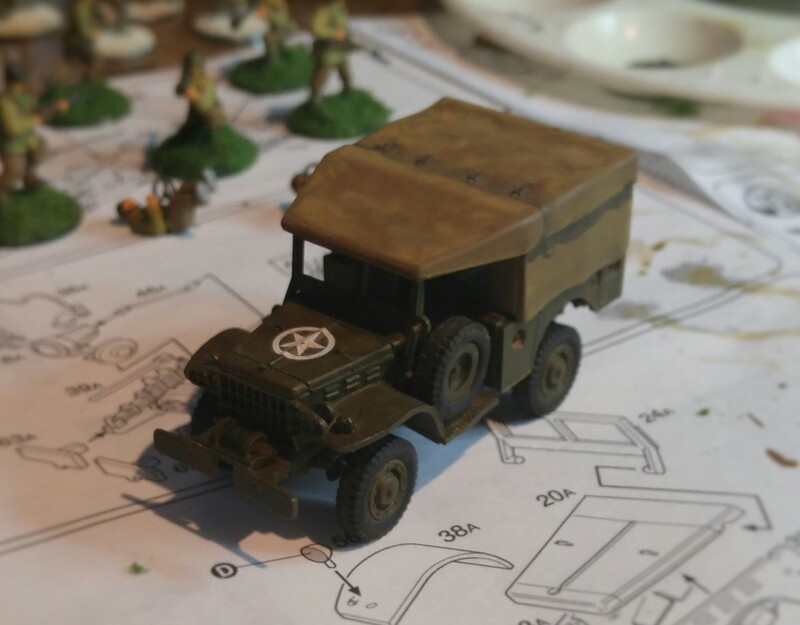 Finished model ready to join the Armored Infantry Battalion HQ. Overall a great little addition to the American army. 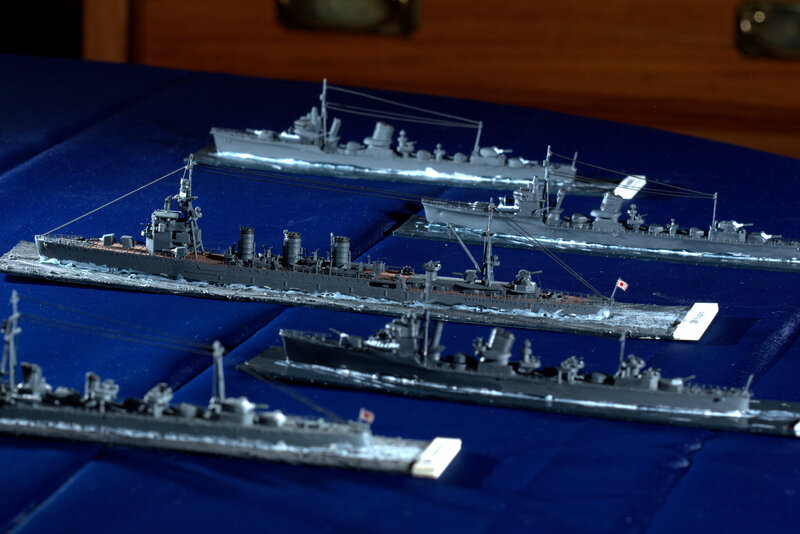 It is getting hard to find these so I was fortunate to purchase enough for my requirements several years ago. 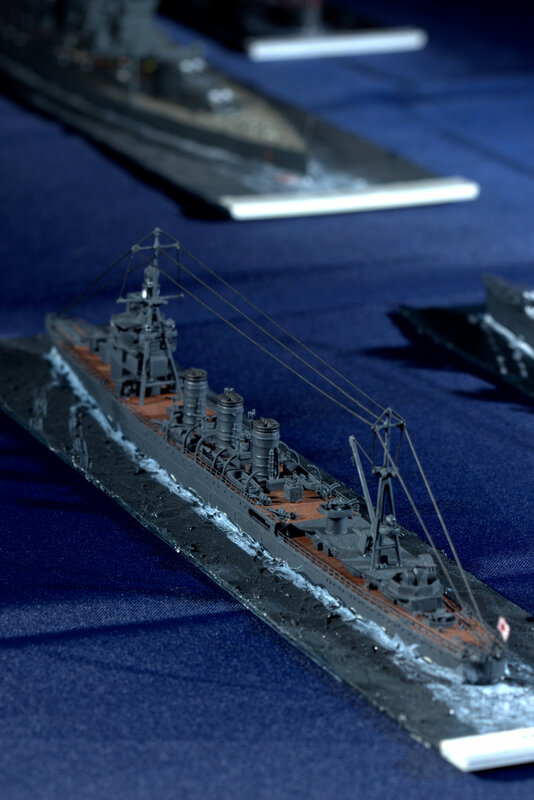 It would be nice if the mold was refurbished if anyone decides to reissue this kit. 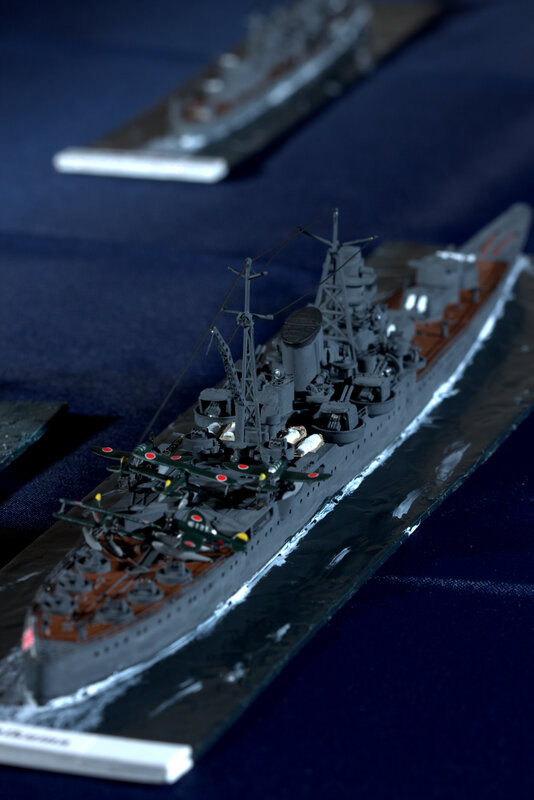 Finally got around to working on and taking pictures of my 1/72 scale German Army. 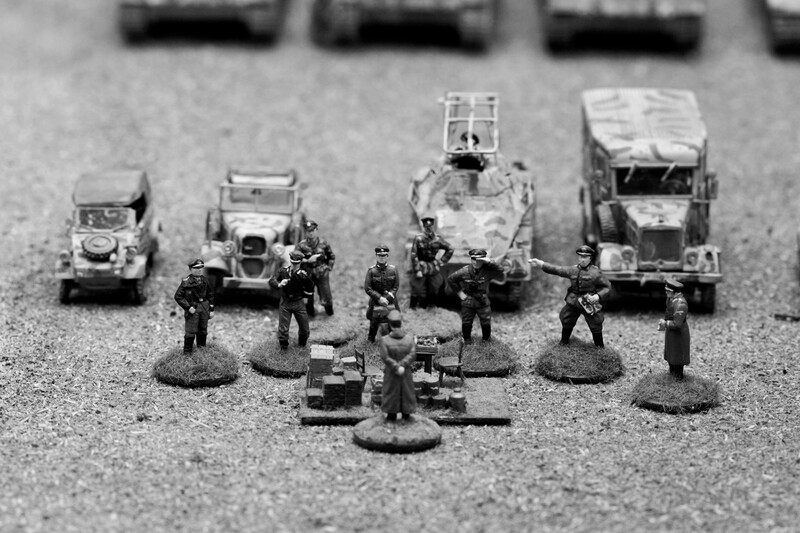 I started the 1st SS Panzer Division about 10 years ago and have had several games with them but never got around to taking pictures. 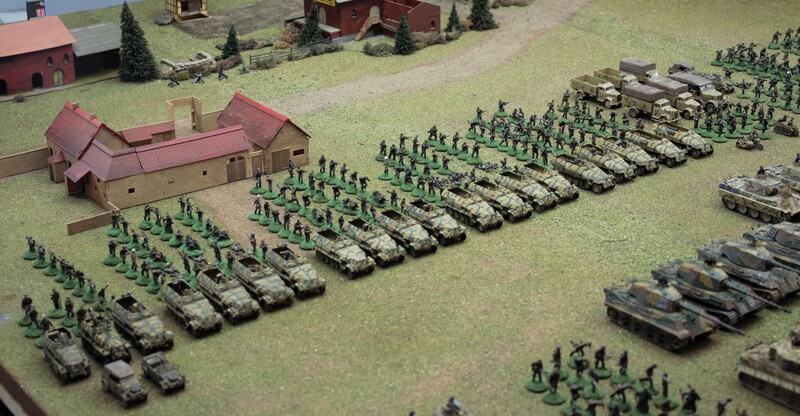 To start with it is a fair size unit and is equivalent to about two panzer companies and two panzer grenadier companies with support. 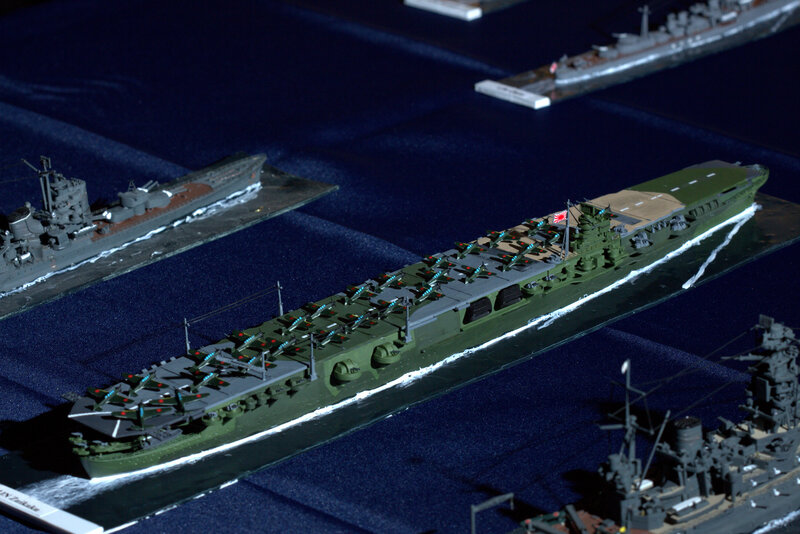 The weapons range over 1943 to late 1944 to allow for different battles. 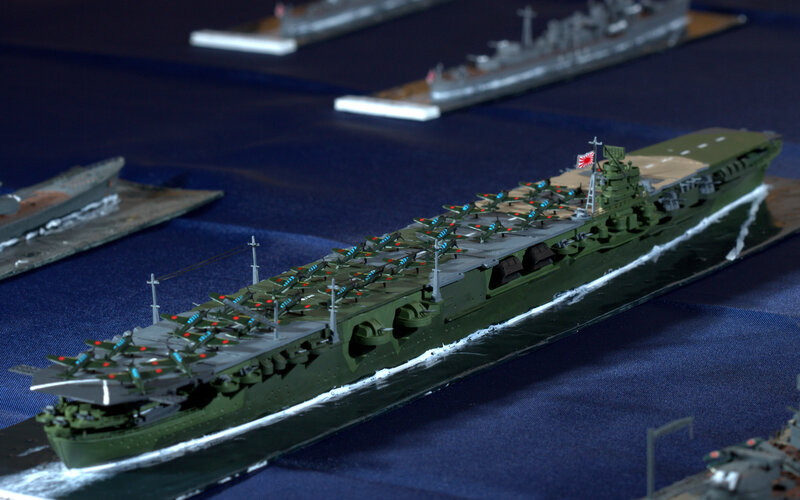 The Imperial Japanese Navy’s Combined Fleet sorties out to meet the enemy. 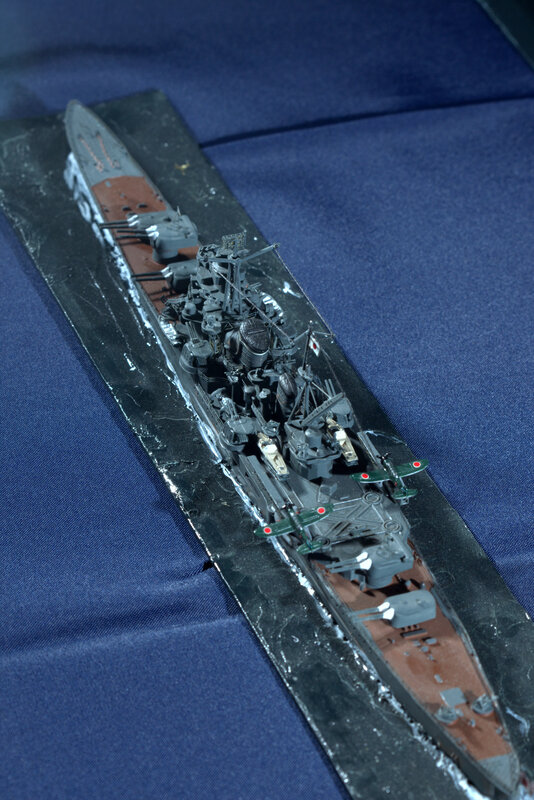 This task force is based around the Carrier Zuikaku and the Battleship Mutsu. 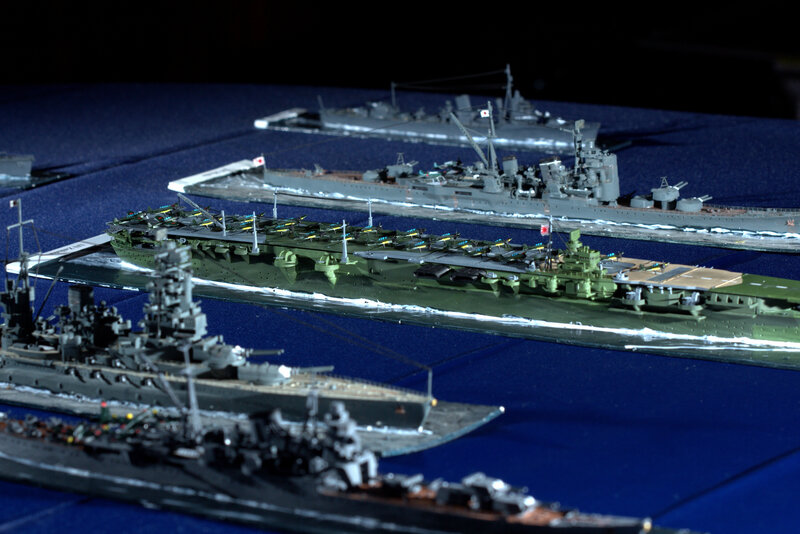 1 Carrier, 1 Battleship, 2 Heavy Cruisers, 2 Light Cruisers and 8 Destroyers. Capt. 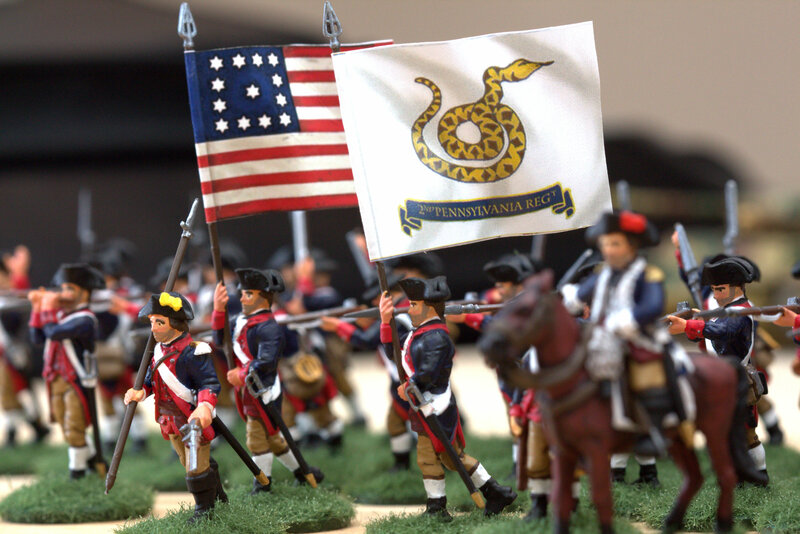 Jacob Ashmead’s 2nd Pennsylvania Regt. 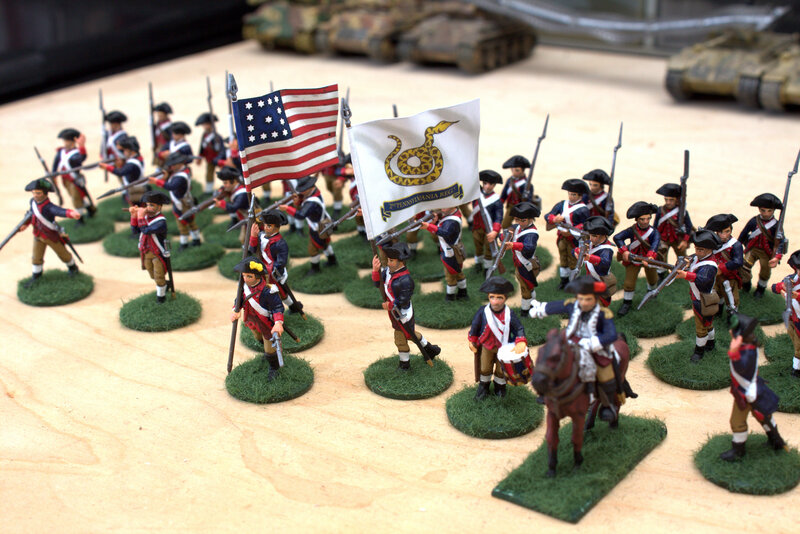 A holiday well spent on working on my AWI army with the addition of Capt. Jacob Ashmead’s Company (46 men) of the 2nd Pennsylvania Regt. 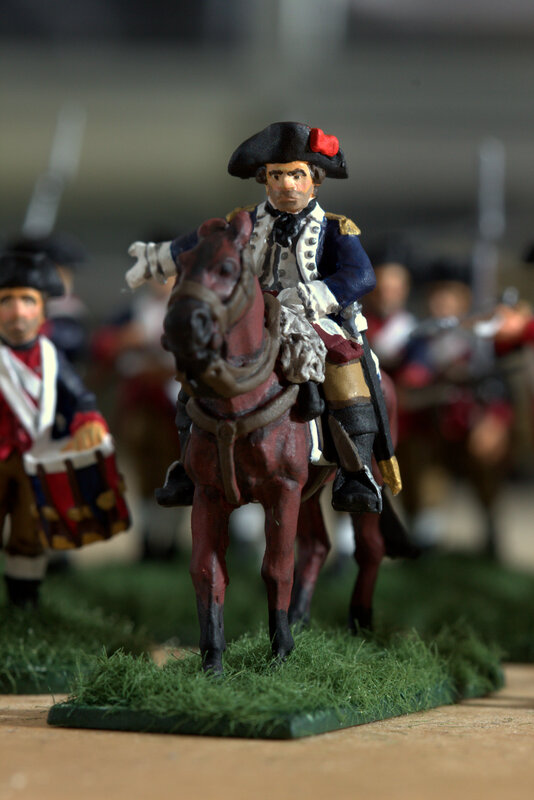 Also Col. Thomas Hartley makes his appearance as the Brigade commander of the 1st Pennsylvania Brigade which includes the 1st Penn., 2nd Penn. and Hartley’s own additional Continental Regt. which will be started soon. Finally, after switching between ships and 28mm AWI, I have completed Major Noel Bell’s G Company, 8th Motor Rifle Battalion 11th Armoured Div. This is one of my favorite units in support of the British Armour. 160 men, 32 vehicles and 4 motorcycles. 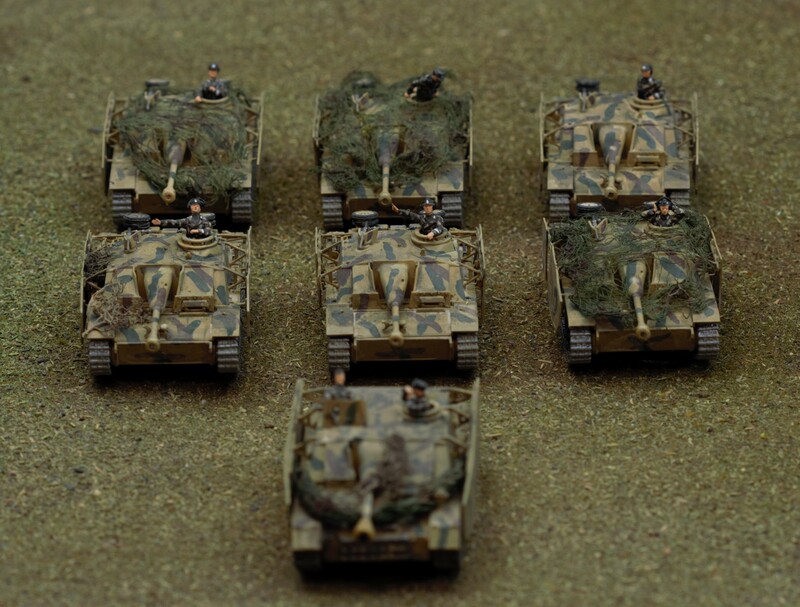 The next project for the 11th Armoured is a platoon of 6 pounders and Lloyd carriers to support G Company. 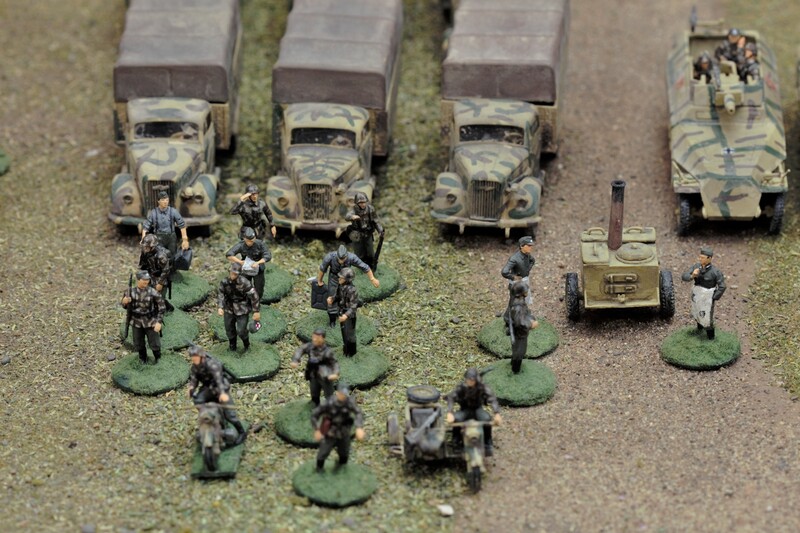 The British are almost ready to take on part of my 1st SS Leibstandarte.